John Hileman, one of the best known men of Ward's Grove Township, whose portrait appears on the opposite page, has long been recognized as one of its most enterprising and useful citizens. After a series of well-spent years, in which he accumulated a competence, he retired from active labor, and is now enjoying the fruits of his industry in the pleasant home at Ward's Grove. His property comprises the home farm of 120 acres on section 7, and twelve acres of timber on section 18. He transformed this from its primitive state into a productive farm, effecting good improvements, and at the same time has borne in mind the welfare and advancement of his township, being one of the leading men in the maintenance and establishment of schools. He thoroughly believes in giving to the young all the advantages possible as a part of society representing future generations. A native of Huntingdon County, Pa, our subject was born in the vicinity of Frankstown, Dec. 18, 1819. He received limited school advantages, and at an early age was made acquainted with hard work. His parents, also natives of Pennsylvania, were Michael and Mary (Milligan) Hileman; the former born in Little York, and the latter in Huntingdon County. Grandfather Hileman was for many years a farmer in York County. The paternal great-grandfather was a native of Germany, and emigrated to America in time to carry a musket in the service of the Colonists in the Revolutionary War. On the mother's side of the house the grandfather of our subject was Capt. Edward Milligan, also a native of the Keystone State. He was married in Huntingdon County, and participated in the French and Indian War, having been one of the pioneers of that county, and living on the border during the troubles of those times. He was in many a hand-to-hand encounter with the Indians, in which he uniformly came out the victor, never receiving a scratch. He was of Irish descent, and spent his last days in Huntingdon County. Michael Hileman, the father of our subject, learned carpentering (sic) when a young man, and in due time operated as a contractor and builder. 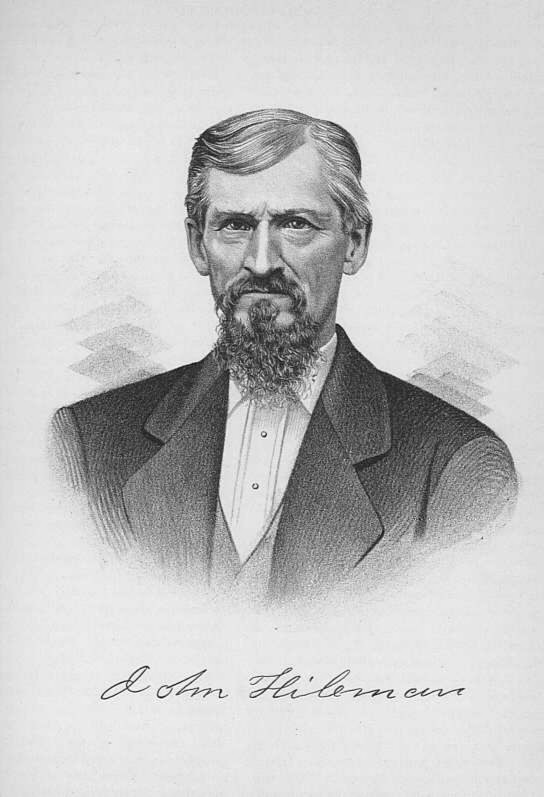 He was married in Huntingdon County, Pa., where he followed his trade of carpentry, and also purchased land to the extent of 300 acres, upon which he resided a number of years; then removed to Clearfield County. After this he engaged in lumbering on the Susquehanna River, and became the owner of more land. He disposed of his interests in the Keystone State in 1853, and removed with his son to Jo Daviess County, in Northern Illinois. After this he practically retired from active labor, and made his home with this son until his decease; which occurred in 1871, after he had arrived at the great age of one hundred and four years, the mother had passed away in 1862 at the age of eighty. Both were members of the Evangelical Lutheran Church. They were the parents of eight children, the eldest of whom, a son, Edward, is now a resident of Johnson County, Neb. ; Eliza lives in Ward's Grove; David and Mary are deceased; Henry is farming in McLean County, this State; John, our subject, was the sixth child; Michael is a resident of Buffalo County, Dak. ; Jacob died when thirteen years old. Michael served as a Union soldier during the Civil War, was taken prisoner, and confined eighteen months in Andersonville. A vigorous constitution enabled him to survive the sufferings which he endured in that rebel stockade. John Hileman, our subject - like Abraham Lincoln - during his early manhood, labored all day at cutting wood, and pursued his studies evenings; gaining the greater part of his education in this manner. At the age of seventeen years he met with an accident, cutting his knee, and taking cold was laid up with this for a period of five years, and came near losing his limb. He continued to reside on the farm, and in the meantime learned the miller's trade. Later he operated as a millwright five years, after which he returned home and resumed farming. In due time he became the owner of 200 acres of good land, upon which he still carries on farming in connection with his father's homestead. From the first mentioned he cleared much of the timber, and erected good buildings. Mr. Hileman, in the fall of 1853, disposed of his interests in Pennsylvania, and came to Northern Illinois, landing in Warren. Shortly afterward he purchased 120 acres of land in Ward's Grove Township, and taking up his abode in a log-house, began the improvements which finally made of it a valuable homestead. He brought the soil to a productive condition, set out forest and fruit trees, enclosed and divided the fields with good fences, and engaged in farming and stock-raising. Later he purchased twelve acres of timber in the northern part of the township. In 1881 he purchased 320 acres in Audubon County, Iowa; which latter (sic) he divided up among his children, giving to each eighty acres. During the Civil War Mr. Hileman was anxious to signalize his patriotism by enlisting as a Union soldier; but of course, on account of his crippled knee, could not pass the examination. He had been married, in Clearfield County, Pa., July 17, 1852, to Miss Sarah Oaks; who was born in that county in 1834, and died at her home in Ward's Grove Township, this county, Jan. 8, 1884. This union resulted in the birth of four children, viz. : Sarah, Mary, Alfred, and Minnie. Sarah is the wife of John Lepper, who is farming in the vicinity of Atlanta, Iowa; they have three children - Mary, James, and Minnie. Mary A. is the wife of Millard Johnson, a farmer of Stockton, this county; their five children are named respectively: Chester, Earl, Sallie, Roxie, and Florence. Alfred married Miss Maggie Dutcher, and is farming on 600 acres of land in Holt County, Neb. ; he is also interested in real-estate. He has three children: Flora, Homer, and Floyd. Minnie is the wife of C. Parker, a merchant of Morseville, Ill., and they have four children. Mr. Hileman, politically, is a Republican, dyed in tile wool. He cast his first vote for William Henry Harrison, in 1840, and also for the grandson of the old hero in November, 1888. He has served as a delegate to the County and State Conventions of his party, and also on the Grand and Petit Juries.